The Crossings Template is a conceptual (hermeneutical) tool for interpreting biblical texts and envisioning the pastoral task through the lens of distinguishing God’s law from God’s gospel. (Click on the icon to enlarge the Template.) 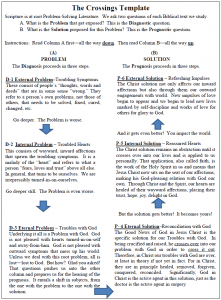 As a tool for interpreting a biblical text, it approaches the Christian story as presented in a biblical text as “problem-solving” literature, a description of human existence that has been (1) critically examined (through the lens of the law) for what is ailing it (diagnosis) and, then, (2) mercifully addressed (through the administration of the gospel) with what can heal it (prognosis). 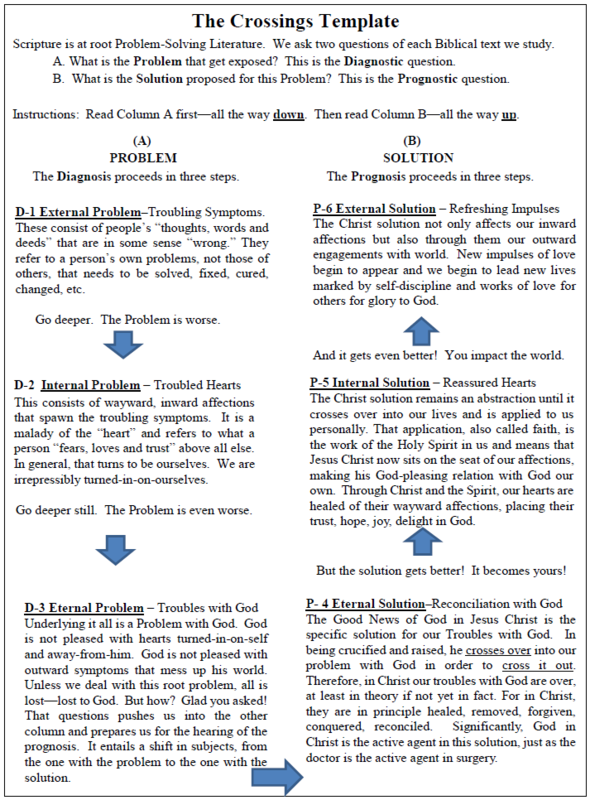 It does this under the presupposition that the solution “fits” the problem like hand in glove, with the root-problem being the sinner’s estrangement from God and the root-solution being the sinner’s restoration back to God through faith in the crucified and risen Christ. As a tool for envisioning the pastoral task (that is, connecting our stories meaningfully with the Christian story) it provides a conceptual framework for viewing, connecting and crossing our stories to the themes and categories of diagnosis and prognosis of a biblical text. What follows is a walk- through (written by Crossings Co-founder, Ed Schroeder) on the logic and use of the Crossings Template for interpreting a biblical text. It is one of many descriptions you will find throughout the website on the use of the Crossings Template. 1. In both the Hebrew language of the OT and the Greek language of the NT the word for Salvation and the word for Healing are the same word. Since salvation = healing, then the opposite [un-salvation] has to be sickness. 2. This simple set of word-opposites is at the center of how the Crossings Community goes about studying texts from the Bible, especially those texts that are regularly read in Sunday worship in mainline churches, Catholic and Protestant. 4. As is often true with any doctor’s-office sort of sickness, the “ouch” on the outside is just the first layer. Outside symptoms point to more serious inner sickness. And the inner sickness often points to a root-sickness that is the cause of all the “ouch,” both inside and out. We follow that three-step pattern, actually the Bible’s own pattern, to see the full picture of the sickness, the un- salvation, that Bible texts regularly point us to. 5. Step one, therefore, asks a text: What is the “outside” symptom of what’s wrong with folks here? What are people doing or saying that is “sick?” Step two asks the text: is it even worse than that? What’s going on inside these folks–in the mind, in the heart– that then comes out as the bad things we see on the outside? 6. And then we ask the text one more time [Step three]: Is it even worse than that? Is there a God-disconnect at the very root of the inside sickness that then bubbles out in what we saw in the first place? 8. We look first of all for the “deep” healing for the God-disconnect. Christ’s death and resurrection are always at the center of that deep healing. We examine the text for its own way, its own words and pictures, for pointing us to healing for our God-problem. Call that Step four. 9. Steps five and six complete the “three steps back up.” So we search the text asking two more questions: [#5] What is the healing coming from Christ’s death and resurrection for the sickness on the inside? And then from that inside-healing, [#6] what is the healing for the sickness on the outside? Christ’s healing is Good News for all three levels–our God-problem, sickness of the “heart” (what we fear, love and trust), and for sickness on the “outside.” When the God-disconnect is healed, the “sickness” in what we fear, love and trust has “medicine” for healing, and from healed hearts comes healing for our words and actions in daily life. 9.5 Sometimes a particular text, especially short ones, will not easily supply the material for all six steps. A needed segment of the diagnosis or the prognosis. In such cases, Robert Bertram, founder of Crossings, gave this advice; “Go to the neighbors for that missing ingredient (cup of sugar?) to complete the recipe.” Namely, look for the missing “ingredients” in the wider context of where this text is in the Bible and add it to the batter.